Happy Halloween! 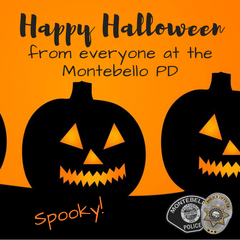 Here are a few tips to help you and your children stay safe tonight! 1. Trick or Treating is about family time, children should be accompanied by their parents. 2. Be safe when walking around your neighborhood by staying on the sidewalks. 3. Cross only at intersections and follow the walk/don't walk signs and stay in the crosswalk. 4. Look left, right and then left again before crossing the street. 5. Bring a flashlight and wear reflective clothing to be extra visible. 6. Parents, check all your children's candy before letting them eat. If you find anything suspicious, play it safe and throw it out.